This isn't Way's crowning achievement with Deadpool, but it's still a fun little romp. If nothing else, issue #17 is worth a read just to see Deadpool's prank. Hopefully the laughs will pick up a bit more and this arc can close out in style next month. I'm excited where this story could take us with only one issue left to go. Surely after this experience, Cyclops will be hiring Wilson to be an X-Man. What else could possibly go wrong to ruin this test run? Daniel Way continues to tighten the plot in this latest issue of Deadpool as our anti-hero continues to show that there is a method behind at least some of his madness and Norman Osborn continues to use the fallout to his advantage. 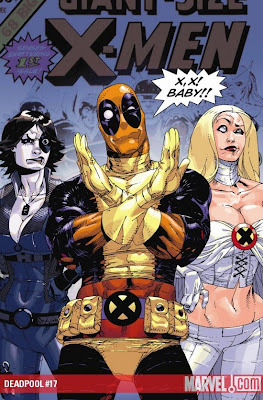 A little more Deadpool would have gone a long way towards making Deadpool #17 a better comic book. While it’s far from bad, Deadpool #17 isn’t as strong as some of the other issues of Deadpool.